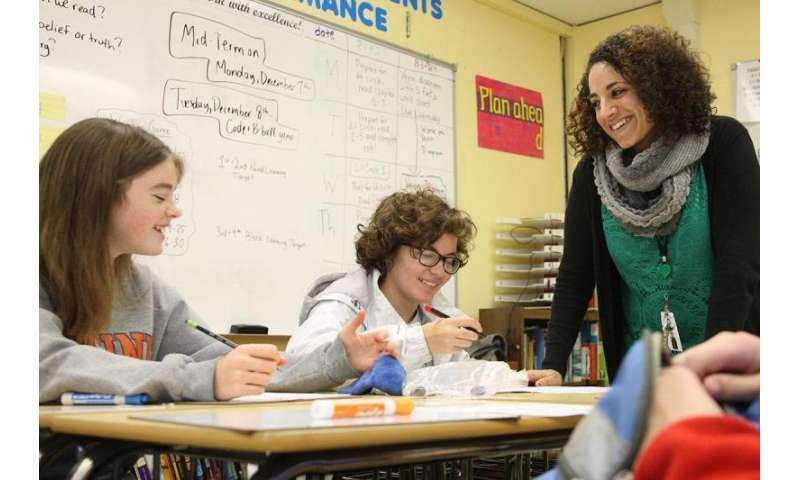 Curry School of Education alumna Nefret Stringham uses skills gleaned from her special education coursework to teach her middle school English class. Future teachers who received multimedia instruction about how to use a specific teaching strategy outperformed peers who read the same information in texts, according to a study from the University of Virginia's Curry School of Education. The study was published in December in the journal Exceptional Children. "As we prepare our students to become the most effective teachers they can be, we continue to research the most effective teaching methods and utilize them in our own teaching," said lead researcher Michael Kennedy, an assistant professor at the Curry School. The multimedia-based instructional tool, called a "content acquisition podcast," or CAP, is a short, multimedia-based instructional vignette that provides focused instruction for a specific topic of interest. Questions can be embedded within each CAP that make them more interactive than a text-based lesson, and also provide feedback to the learner – and instructor – on the user's performance. The specific lesson this study reviewed covered a method of measurement well-known in the special education field called "Curriculum-Based Measurement," which allows teachers to test and graph a student's performance on a particular competency – for example, a student's ability to read aloud – over time. "Curriculum-Based Measurement is a topic and skill teachers definitely need to know about," Kennedy said. "But it has a lot of moving parts and can be a little tricky. We wanted to create and test a Web-based lesson that could give teacher candidates a first glimpse into the measurement, learn key terminology, see some examples, and learn how it works." In the study, 270 teacher education candidates from the University of Virginia, Anderson University and Augsburg College were randomly assigned to either watch the CAP or read an article written specifically for teachers on Curriculum-Based Measurement – the latter being the most common form of instruction used in education schools. The CAP is about 25 minutes, whereas the group that read had unlimited time. Students who watched the CAP significantly outperformed peers who read the article containing the same information on a test of knowledge and skill application. The students reported being motivated to continue watching the CAP and felt like the content being taught was very important for them to learn, compared to the text-only group who reported lower levels of motivation to stick with the reading and make the content part of their repertoire. That higher motivation predicted higher learning as well. These findings are not a fluke. The study is the 14th in a line of experimental studies demonstrating the capacity of CAPs to efficiently and effectively improve teacher candidates' learning. As is true with the majority of technology and learning, CAPs are not successful simply because they are based online, Kennedy said. The critical element to their success is the specific way they are designed. "CAPS are effective because of the 12 instructional design principles that are infused into each video," he said. For example, the "coherence" principle – one of the 12 integrated into each CAP – teaches that multimedia-based instruction should be constrained to the most essential information, without the addition of interesting, but ultimately extraneous and distracting details. So when students watch a CAP, they receive focused, streamlined instruction instead of exploring every nook and cranny of a topic like a longer lecture or written text might do. "Thus, a student has an easier time navigating a CAP and remembering key information because it is served up to them on a platter, instead of having to find the most important information buried within a reading or lecture," Kennedy said. Another example is the "segmenting" principle. CAPs are broken into learner-sized segments and organized logically, so viewers can take breaks and reflect after each one. Lectures and journal articles sometimes have these features, but not always. The students who are watching the CAPs are not only learning the content contained in the CAP more effectively, they are more likely to utilize them once they become teachers. "The idea is once the teacher candidates watch the CAPs they are in a strong position to implement the practice once they reach the classroom," Kennedy said. Kennedy said he uses CAPs all of the time in his courses, including the one special education course all Curry School students must take, regardless of their area of certification. "I think more and more colleagues, both here and around the country, are using them," Kennedy said. As online learning continues to grow, Kennedy sees CAPs as an effective tool for online educators to include in their instructional repertoire. "CAPs require an up-front cost of time to produce, but once a video is made, it can be used long-term," he said. "Instructors can consider having students watch a CAP before a longer lecture as an advance organizer, or before a quiz or test as a review. The flexibility of CAPs is one of its greatest strengths."